Assuming a loss today to Pittsburgh occurs,the Browns are guaranteed to pick between sixth and ninth (tiebreakers depending) in the next draft. The Browns could be guaranteed the higher pick in this range if any of the following win today-Tennessee,Buffalo,Arizona are currently tied with Cleveland with five wins. I wanted to jot a few things down while I had a minute or two. If all falls right today,I'll get to do something that I have always wanted to do-have a Strat O Matic league with face to face teams. It'll be a five team league that will use the 1960 season and the drafttod is scheduled for today. Looks like Pat Shurmur and Tom Heckert will be getting their severance checks tomorrow as the Browns will not wait long after today's game in Pittsburgh. Those of you long time readers know how I feel about the Weather Channel since being bought by NBC. Too many shows,the wrong personalities being pushed and the better ones leaving the company and just not enough focus on the weather. The focus has become the brand such as naming of winter storms when no one else in the weather community does so and the latest gimmick? The fantasy snowfall league where they draft cities rated on their snowfall. It is harmless,but it takes away credibility and if you are looking for say - a weather forecast,silliness like this takes away time to find it! Back tomorrow with plenty of Browns thoughts! A bit late,but I still wanted to jot down a few thoughts on the Cleveland Indians managing to land Nick Swisher to plug into a corner outfield spot and add power to a team in desperate need of it. Swisher was tabbed to a four year deal for 56 million dollars with an option for a fifth year,provided Swisher reaches a certain threshold of numbers and games played. The 32 year old Swisher will replace Shin-Soo Choo as the starter in right field and along with the recent signing of Mark Reynolds gives the Indians power that they did not have last season. The pairing of Swisher and Reynolds should have a strong chance of combining for sixty homers and three hundred strikeouts,but I think Cleveland will make that trade off considering the desperate need for a power infusion. Swisher has never hit under 21 homers in any season in the big leagues and instantly becomes more than just a free agent signing. Nick Swisher may have wanted to play on the West Coast (his wife is an actress) and he likely would have rather played on a contending team,but if the Indians could not sign a player from near the area (Parkersburg WV isn't exactly Solon or Strongsville,but still) and has state ties (former Buckeye) that had a limited market for his skills,who can the Wahoos sign? 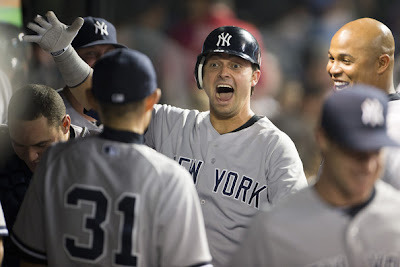 Nick Swisher instantly becomes the face of the franchise and gives a fan base that has been disappointed by being the runners up in so many attempts to sign players,a reason to hang in there. Do not get me wrong,Nick Swisher is not a franchise player,but he plays very hard and lends a charisma that the franchise has lacked over the past few years or at least before Grady Sizemore turned into a piece of peanut brittle. I wish the deal was a year shorter,but to get players to Cleveland,one must overpay at times,so it is understandable to make this deal work. The Indians also made a business deal by selling the team owned Sports Time Ohio network to the Fox Sports bunch for 230 million and Fox Sports will pay at least 40 million a year for the next ten years for rights to televise the Indians. I would think that the Fox people would keep STO rolling as a side channel for those April nights when the Indians and Cavaliers each play and once you get cable/satellite clearance,you generally do not want to give that up. I have no concern with what channel shows the games,but I do hope that STO stays somewhat intact as I enjoy the local Cleveland oriented programming on STO more than I do the national based (other than Cavalier shows) programming on FSO. If Bruce Drennan,Chuck Galeti and the Browns Red Zone stuff stays on STO,I'll be fine with any other changes ,if not then I'll be more bothered. I have the Directv sports package mainly for the Cleveland talk (The games are paid for separately),so I might drop that if radical changes are made and add more of the same stuff that I see on other networks. It is a good business move for the Indians,who get some dollars and less of the responsibility of running a network,while Fox wins as well with eliminating its competition and adding another sports entity to its network. A glance back at Denver,a glimpse towards Pittsburgh! This will not be the usual recap on a Browns game. Christmas business kinda of took care of that,but the Cleveland Browns loss in Denver will pop up in this post. The Browns look to be starting Pat Shurmur's favorite player in what will be Pat Shurmur's final game as head coach. Brandon Weeden and Colt McCoy suffered shoulder injuries against the Broncos that will likely see them sit out in this Sunday's finale against Pittsburgh. The winner in this scenario besides the Steeler defense? Thad Lewis will be getting the start in his first chance to get an NFL snap. Lewis has long been a Shurmur favorite dating back to their time in St.Louis and is pretty mobile,which is something that he should need this week. Why will Lewis need his mobility? Between his inexperience,an angry bunch of Steelers (Between being eliminated from the playoffs last week and the Browns win earlier) and a missing Trent Richardson,Lewis might be running for his life. Why will Lewis not have Trent Richardson in the lineup? Because Pat Shurmur pulled a "Steve Robinson" (I've told you many times why this tactic got its name) and called three timeouts to have a final possession with less than two minutes to go in a 34-12 game. This same drive was where Colt McCoy was injured,but that is understandable-someone had to take the snaps. However,having Richardson in the game as a pass blocker made no sense to risk injury and that is exactly what the Browns received-Richardson injured on a meaningless play that should have seen him on the sidelines to start with. The injury will likely cost Richardson a 1,000 yard season as he currently has 950 yards entering Sunday. These are the types of decisions that will see Pat Shurmur hunting employment on Monday and deservedly so. I would not mind Tom Heckert staying,but he looks to be gone as well. I am very much against Mike Lombardi as Heckert's replacement because,well,he has been a failure at every job he has had with the exception of being Bill Belichick's mouthpiece/shill at NFL Network. I am open to hearing names for head coach. Two names keep appearing as Browns QB possibilities-Michael Vick and Ryan Mallet. Vick is a no,cannot stay healthy and looks washed up to me,but I liked Ryan Mallet at Arkansas. Huge arm to fight the Lake Erie wind and large in stature,Mallet (at Arkansas) reminded me of Ben Rothlisberger with better arm strength. I am ordinarily skeptical of dealing with Bill Belichick,who deals players that usually do not fare as well in new places,but Mallett is not smallish Brian Hoyer or chicken winged Matt Cassell. The long rumored trade was finally finalized today as the Pirates sent Joel Hanrahan and Brock Holt to the Boston Red Six for four players of varying degrees of interest. The four new Pirates are outfielder/first baseman Jerry Sands,reliever Mark Melancon and two prospects in shortstop Ivan De Jesus Jr (Hey,my friend!) and pitcher Stolmy Pimentel. I have no problems trading Joel Hanrahan despite his numbers as a Pirate. Closers are a disposable commodity and I really hate to spend a ton of money on closers as you just cannot count on them (or relievers in general for that matter) for the most part from season to season. Hanrahan has performed very well as a Pirate,but Hanrahan will make seven million dollars in 2013,which more than I prefer to pay on a low budget team for a closer. However,I must admit I am not thrilled with the return for the most part. 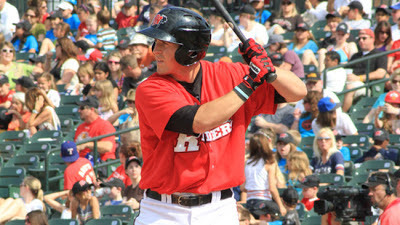 Jerry Sands is the centerpiece of the trade and as recently as last winter,was thought of as a top ten prospect in the game. Sands has plus power,which has been somewhat inflated with two years at AAA Albuquerque (a hitters park in a hitters league) and can play outfield or first base. The acquisition of Sands means the Pirates are not likely to be finished dealing as there is a sudden logjam at first and right field between Sands,Garrett Jones,Jose Tabata,Travis Snider,Gaby Sanchez and Clint Robinson. At least one and possibly two of the group could be elsewhere before opening day,so something has to give. The 25 year old has yet to establish himself in the bigs in two different cameos,but the data is not extensively large,so I am far from ready to give up on Sands. Mark Melancon was horrid in 2012 with the Red Sox,but was excellent in his previous two seasons as an Astro. Melancon will likely replace Jason Grilli as the setup man as Grilli graduates to the closer role with the absence of Hanrahan. Ivan De Jesus Jr has had just eighty at bats over the last two seasons in the bigs,so he,much like Jerry Sands,has not had a large amount of big league time to evaluate from yet. De Jesus has spent time in the minors playing second,third and shortstop,although he seems a better full time fit at second base. De Jesus hit for an high average for much of three seasons at Albuquerque,but has little power and below average speed and does not seem to be more than a utilityman at the big league level. Stolmy Pimentel was rated as one of the top players in the Boston system entering the 2011 season,but struggles in both seasons since at AA Portland has diminished his worth in many eyes. Pimentel is the one new Pirate that I have seen in person and throws in the mid 90's. The biggest issue for Pimentel has been fastball command,which to me is usually a red flag for long term viability as a starter. All told,I agree with the move to trade Joel Hanrahan,but I would have liked to have seen another top level prospect included. 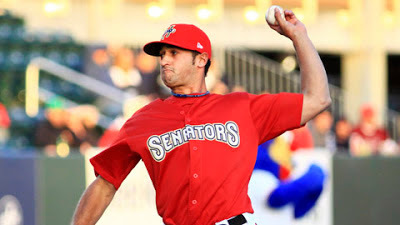 Jerry Sands fits the bill of a top level prospect,but Stolmy Pimentel's Eastern League struggles make him suspect in my eyes,Mark Melancon will fit the bullpen need,but is a dime a dozen reliever and Ivan De Jesus Jr is the same as a utility player. Time will tell,but in my opinion,this deal depends on Jerry Sands performance. I'll try to get back with a Browns recap of their loss in Denver,things were pretty busy at the World Headquarters on Christmas Eve. I'll also be doing a post on the Joel Hanrahan deal to Boston once I know who all the players involved are! Looking at the Browns draft hopes. A few words on the Browns moving up through the draft with two weeks to go in the NFL season. The Browns figure to lose their final two games on the road,so they could pick between 3rd and 11th depending on the results of the other teams and the resulting tie breaker. I can see the Browns gaining several positions by passing their fellow five win teams as Buffalo has a chance to win both their games,so there is one spot. Carolina will likely beat Oakland at home,so there is another and I like Tennessee to beat Jacksonville at home for another. Arizona has a chance to beat a struggling Chicago squad at home,but will not beat the 49ers on the road,so the Cardinals might stay at five wins. San Diego is likely to win one of their two games,so that would be another spot. Of the four win teams,Oakland could win one of their two games,but both are on the road. Detroit might take Chicago at home,which would bring tiebreakers into play. Philadelphia is unlikely to win either of their games,but if I had to pick one,Washington at home is more likely. Looking at it that way,the Browns are pretty safe to move up to the 6th or 7th pick and would need some breaks to go higher. The Browns released corner Dmitri Patterson (Claimed by Miami) in what might show the conclusion of Tom Heckert in Cleveland. Heckert signed Patterson to a contract extension and after some poor play and injury issues,this looks like Joe Banner has already begun to flex his muscle in the personnel department. Back later with the Joel Hanrahan trade and Browns vs Broncos. The Pittsburgh Pirates added to their starting rotation with the signing of Francisco Liriano to a two year deal worth seven million per season. The former Hagerstown Suns lefty spent last season with the Twins before a late season trade to the White Sox. The once dominant Liriano has posted ERA's of over five in each of the last two seasons and has had periodic problems with his control with an average of 5 walks per nine innings. Liriano still has strong stuff though with a 2011 no hitter to speak of his arsenal. Liriano's slider remains his out pitch and he throws hard enough (low to mid 90's) to avoid the label of finesse' pitcher. The addition of Liriano likely sets the Pirate rotation for the first half of the 2013 season with the possibility of Gerrit Cole joining for the second half,assuming his AAA performance is strong. 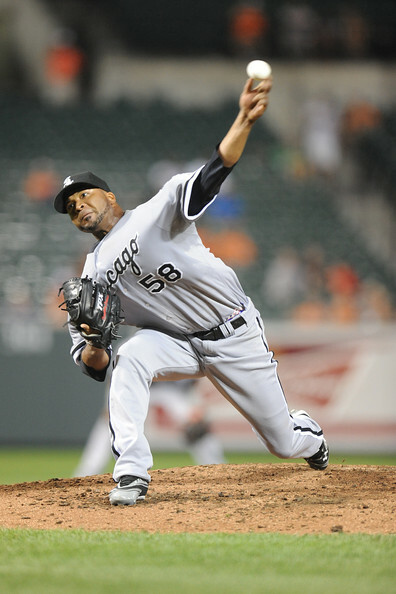 The rotation (in no particular slot in the rotation) looks like Liriano,Wandy Rodriguez,A.J. Burnett,James McDonald and the winner of a Jeff Locke vs Kyle McPherson battle for the final spot. This has the potential to be the most solid rotation that the Pirates have had in a while,so on that point,Liriano (if even average) is an upgrade (I think) over the Kevin Correia types that the Pirates have usually signed to plug into their rotation. I can see this working out for the Pirates,but I can also see this being another version of the last off seasons lefthanded signing in Eric Bedard,which proved to be a failure,but a Liriano flop would be worse as the Bedard deal was one year as compared to the two year contract signed with Liriano,although the contract would not be a budget buster. It is a risk,but I do not see Pittsburgh from having much choice. As sad as it sounds for those of us in the real world,Seven million dollars does not buy sure things on the free agent market,seven million buys players looking for new scenery,players with injuries or less talented players getting the most of what they have to offer. The winter meetings after the 1978 season watched two teams trade solid third basemen coming off disappointing seasons. Both players were popular with their fan base yet few were screaming about the deal from either side. Neither team improved a ton after the trade,but it was not due to either player,who both made All-Star team in their new cities. The Toby Harrah for Buddy Bell swap was not one for the ages,but it was one that changed the sports life of one ten year old for good. I was a Texas Rangers fan mainly because my dad had been a fan of the Washington Senators before they moved to Texas and remained so (he eventually would convert to the Orioles) and Toby Harrah was my favorite player. Harrah had his worst season of his career in 1978 and had been rumored to be on the trade block after losing playing time under manager Billy Hunter,who was fired before the last game of the season. Harrah made one pinch running appearance in the two games,which allowed me to holler loudly once and then Harrah would not play further in order for Kurt Bevacqua (of the bubble gum blowing title and King of the Hill fame) to play both games at third base. That should have been a red flag on the Hunter-Harrah relationship. Looking back,one wonders why the need to trade Harrah,if the issues had been related to the fired Hunter,but the Rangers might have thought they needed better glovework and Bell was the better player with the leather of the two. I had chosen Toby Harrah as my favorite player when I started rooting for the Rangers,so as a ten year old-I was furious! Nothing against Bell,who I liked,but I was not happy. During the same winter meetings,the Rangers traded Mike Hargrove to San Diego (Ironically,midway through the 79 season,Hargrove would be reunited with Harrah in Cleveland),so I was especially unhappy. 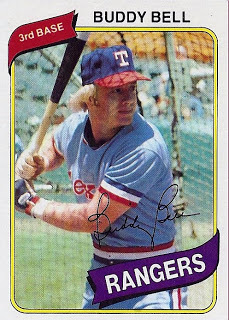 Two months earlier,Texas had traded another Shawn favorite in Bobby Bonds to you guessed it-the Indians,so considering the two trades,adding to the Ohio personal connection for me and that in a two month span,my three favorite Rangers were no longer so,this ten year old was finished. The deal was finished,my loyalty was transferred from the Rangers to the Indians. As soon as this monumental decision was made,I instantly began to bug my dad to take me to massive Cleveland Municipal Stadium on our next trip to Ohio to visit family. Dad did so taking my grandparents and my favorite aunt and uncle,Becky and Terry for a colossal battle between the Indians and the Kansas City Royals,which amazingly the Indians won in a .500 season that saw them finish in sixth in the powerhouse American League Eastern Division. 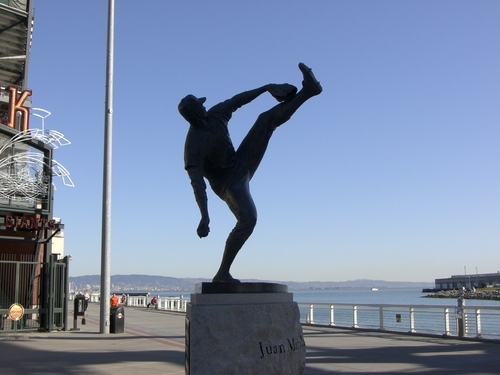 Three things that I remember most on that day-A leaping grab by shortstop Tom Veryzer to end the game,Bobby Bonds spoke to me "Hey there,man" and that it seemed like no one was there in the huge stadium (attendance numbers-barely over 9,000 in a 74,000+ stadium for baseball). I never held the trade against Bell,I actually became a bigger Bell fan,which made me getting to meet Buddy last season in Frederick a big deal to me. I've never met Toby Harrah,who currently is a roving hitting instructor in the Tigers system. Of all the players that I have sent cards to in the mail,Toby Harrah is not one of them. Why? I just never wanted my favorite player of my youth to perhaps not sign them,although Harrah has a good reputation for signing through the mail. Buddy Bell would spend seven seasons in Texas before finishing his career with the Reds and a brief cameo in Texas with both the Astros and Rangers. 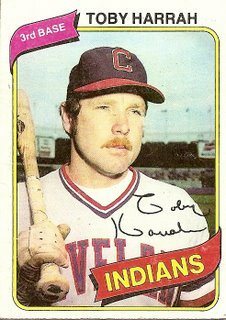 Toby Harrah would spend the next five seasons in Cleveland before being traded to the Yankees,where he spent one season and then finishing his career with the Rangers with a two year return to Texas. The fifteen year old Shawn was a different person naturally than the ten year old version and the Indians were cemented as my team. I've written before that I love the Pirates,but the Indians are special to me. I just prefer National League baseball. In the end,it was a pretty even trade,each team received back what they gave-a very good third baseman. Bell was the better average hitter and a little better with the glove. Harrah hit for more power and was the faster player. Both players were productive in their new cities,neither team should have been disappointed. 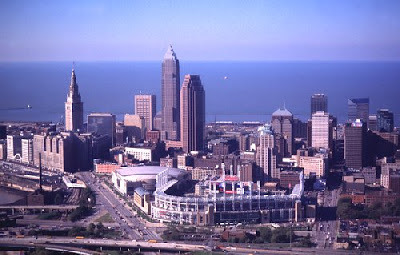 Enjoy this guest post from my good friend Big Don on his trip with his friend Mike to Cleveland. Mike and I decided to purchase tickets to the December 9 Cleveland Browns game. A short time after that, I looked at the Monsters and Cavs schedules to see if either, or both teams had a home game on December 8. I told Mike that the Cavs were playing Detroit at home on December 8, but the Monsters did not have a matinee game on December 8. Then, I checked the Erie Otters of the Ontario Hockey League home schedule to see if the Otters had a home game on December 8. Neither of us had been to Erie for an Otters game in a long time. The original idea for this trip was the Erie Otters home game on December 8, and Cleveland Browns game on December 9. A few days before this trip, Mike told me that he wanted to attend the Cavs game, instead of the Otters game. Mike had attended only one NBA game before December 8. I hadn't attended a NBA game in twelve years, so I was fine with Mike's decision. The next thing was to check the hotel rates. I started out with a place in Willoughby Hills (a few miles from Classic Park), that Mike and I had stayed at three times before this weekend. The rate was pretty cheap to begin with, and I received an email to take an additional 10 percent off. We were happy about that. We went to the Wheeling Nailers game on December 7 and talked about when we should leave on Saturday. The forecast for Saturday was for rain, so we decided to leave early, but not too early. Mike and I left my house about 12:20 pm on Saturday. In keeping with the traveling tradition, Mike had music that I hadn't heard in a while, or have never heard at all. The first stop was a travel plaza in Eastern Ohio for a whiz break. We consumed too much tea and water on the way. The second stop was Walmart near Ravenna. I bought a Browns knitted hat and a few snacks for the Browns pre-game on Sunday, and Mike bought a Cavs knitted hat and a few snacks for the Browns pre-game on Sunday. I was not about to go to the stadium hungry and spend $20 or $30 on food. Mike thought the same thing. We got to Cleveland early, and drove around to find a decent parking place. We ended up parking at the garage next to Progressive Field and "The Q." I asked Mike if he wanted to eat at one of the bars/restaurants down the street from "The Q." He said "yes." I had been to Cleveland many times over the last nineteen years, and had never eaten in one of the bars/restaurants until Saturday. Mike and I walked down the Street, and decided on Winking Lizard Tavern. I will give you thoughts on Winking Lizard later. We went to "The Q", and got posters and programs. Mike went into the Cavs store, and I waited near the entrance. Some of the Cavs girls were signing autographs, but the line was too long, so we passed on that. I did not say any smart-assed comments like I did before the Monsters game. Mike and I went to our seats, and were ready to watch the game. Before the game started, I said "The Cavs will probably lose this game, but I hope that they don't get blown out." Some idiots kept getting up after the game started. I was going to say something, but I didn't. I pointed to a mostly-empty section next to us, and then said "Hey Mike, are you ready to move, because I have a feeling that these idiots are going to do this all game." He said "Let's go." The game started out as "The Tayshaun Prince Show" for Detroit. The Cavs came from behind and even had a lead going at halftime. The Cavs scored a putrid 18 points in the third quarter, and dug a hole that they couldn't get out of. This is when Brandon Knight of the Pistons became a one-man wrecking crew. The Cavs fought back, but they didn't have enough to win the game. Anderson Varejao and Jeremy Pargo - who I ripped on before the game, each gave a good performance. The Cavs lost 104-97, and we thought "At least the Cavs didn't get blown out." We waited for a while to exit so we wouldn't get caught in traffic. We checked in at the hotel, and then decided to go to the Walmart that is down the road from Classic Park. We got back to the hotel and each went to sleep fast, because we wanted to get to Cleveland Browns Stadium early on Sunday. I woke up a little earlier than I wanted to, but I was cool with it. Mike woke up about ten minutes after I did. Each of us did his morning routine, and then we left for the Browns game about 10:20. We found a parking garage near the stadium, and then stood around for a while. We kept looking around and taking everything in. "I can't believe we are here" was said a few times. We wanted to avoid a long security line, so we started walking towards the stadium about 11:10. We walked slowly and took it all in. We went through security. I told Mike "The team shop is to the left," because I knew he wanted to go there, and I remembered that from buying the game tickets back in August. Mike bought some nice hats and a few other things, and I bought a few publications in the team shop. The next thing we did was take some pictures from the lower level. More on that later. Mike likes magnetic schedules, and after a few attempts got some. I got a few as well. You can guess who is getting one of them. Then it was time to walk up the ramps. I said "I hope that this isn't like Baltimore, with numerous ramps to walk." Mike had to stop about halfway because his leg was hurting. I was okay, but had a slight breathing issue due to nasal congestion. Mike got a few texts and phone calls while we were on the way to the game. Mike and I walked up to the 500 level and looked out at Lake Erie. Then Mike answered his texts and phone calls. There were many other people doing the same thing. Mike and I had seats in the very top row of section 537. Walking up the steps is okay for about the first 20 rows, then your legs start tightening up. We laughed about the climb. I said "I never could have climbed those steps when I was sick." We sat down, looked around, and got ready for the game. When KC scored their touchdown, I thought "This is going to be a long afternoon." Most of the games that I have seen in person have been blowouts. You know what happened in the game, so there is no need for me to go over that. During the third quarter, I had to use the restroom badly, but something told me not to go. That's when the Browns intercepted the ball. The first words out of my mouth were "Thank God I did not go to the restroom, because if I would have missed that, I would be pretty pissed off." When the Browns were on defense, I started saying D, then pointed to the fence that was behind us. Mike was laughing, and then he started doing it too. We probably looked silly doing it, but it was still funny. A man in the section next to us was yelling too much, and his voice kept cracking like a 13-year old, so everyone had some fun with that as well. After the game, Mike and I took our time because we didn't want to get stuck in a bunch of traffic. We were two of the last fifteen or so people left in the building. We were walking down the ramps to leave. I noticed some plastic fencing that was blocking off the one level. I went over to it and said D, and I went over to pick one of pieces of fencing up. I picked it up a little, and then tried to put it back down. The piece of fence would stand up on its own, so I had to let it fall. It made a loud noise, so I thought that I might get in trouble. Nothing happened, but Mike and I were laughing like crazy. Mike said something like "See what happens." I was too busy laughing though. Mike called his father, and asked him if he wanted a Browns hat. The Browns did not have either hat that Mike's dad wanted, so Mike's dad didn't get one. Mike and I walked back to the parking garage and left Cleveland at about 5:20. Mike put on a CD that he bought on Saturday night in Walmart. Even though we left late, we still were stuck in traffic. We were both hungry at that point. I suggested that we eat at White Castle because there is none of those near the area where we live. Mike said "That's a good idea." It was more difficult to find than it should of been, but everything worked out in the end. We ate at the White Castle near Bedford,OH. Neither one of us were in a hurry to get home. Mike is on vacation through December 16, and I worked relatively late on December 10. We arrived at my house, and the friendly neighborhood cat was there to greet us. We said that it was a fun weekend, and then I walked into my house. In the Cleveland Browns final home game of the season and with a three game winning streak in hand,The Browns looked to make a statement on the future of several pieces of the organization. Brandon Weeden,Pat Shurmur and Tom Heckert all could have taken a large step towards keeping their job with a Browns win. At the end of the day,which featured a 38-21 loss to Washington,all three might have seen their final home game in Cleveland. Four second half touchdowns by the opposition will do that often. Trent Richardson rushed for two short yardage scores and Brandon Weeden threw a 69 yard TD to a streaking Travis Benjamin for the other score. 1) Considering the total picture,three wins,game at home and Washington starting Kirk Cousins in place of Robert Griffin,I felt pretty strongly that the Browns had a real chance to win this one. With a 14-10 halftime lead,the Browns then promptly laid an egg. Total collapse on both offense and defense. 2) Brandon Weeden was just awful in this game. Two interceptions with one caused by downright staring at the receiver and the other with a bad underthrow. Only the long TD toss to Travis Benjamin gave the Browns anything from the QB position. 3) The Browns had the lead and the ball to start the second half when Weeden threw an awful interception deep into his own territory. A few plays later,Washington scored and the game was all downhill from there. 4) Trent Richardson ripped off a 14 yard gain on his first carry and then would carry just ten more times,finishing with 28 yards on the day. Pat Shurmur reverted to form of not taking advantage of his top playmaker and decided to make Brandon Weeden the focus of the offense..
5) If you defend Brandon Weeden as being a rookie then watching Kirk Cousins play defeats your argument. Cousins was selected by Washington in the fourth round in the same draft as Weeden,made his first start and showed the poise in the pocket that Weeden has rarely used this season. It was just one game,but could you make an argument that another first level player in the first round instead of Weeden and Kirk Cousins in round three or four might have made the Browns a better team? 6) Way WAY too many broken tackles against the Browns. I counted three times where defenders went for the pad popping hit only to watch the runner bounce off them and continue on downfield. Call me an old traditionalist,if you wish,but I remember a day when you made the big hit AND the tackle!!! 7) Bad day in coverage too as even Joe Haden was beaten a few times by Pierre Garcon. 8) Pat Shurmur is cooked and that is not a bad thing. The Browns are not going to beat Denver and Pittsburgh on the road and that puts things at 5-11 with just two of the wins over respectable teams (Bengals and the non-Rothlisberger Steelers). 9) Sad to say it looks like Tom Heckert too. I'd keep Heckert,but he might have have his fate attached to that of Brandon Weeden and that is a fading hope. 10) 5-11? Well,that looks like a draft pick between 6th and 11th according to tie breakers. Another season of useless wins over bad teams costing top talent. I don't see wins in the next two weeks,so the most fun might be rooting for wins from these teams-five wins (right now) teams-Buffalo,San Diego,Carolina,Arizona and four win team-Tennessee,Oakland, Detroit and Philadelphia. GO ALL OF YOU GUYS!!! 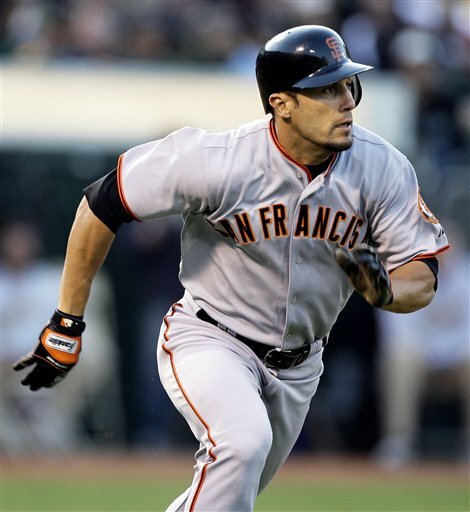 The defending World Champion San Francisco Giants are not exactly a small market team. They are comfortably in the middle,nowhere near the financial budget of the Yankees,Red Sox and the newest and maybe biggest of all,if not the National League-the Los Angeles Dodgers,but well above the Clevelands,Pittsburghs and Minnesotas. However,the spending of the new ownership of the Dodgers puts the Giants in a position familiar to fans in Toronto,Baltimore and Tampa-Having to budget against a bully. San Francisco has resources similar,if not above those teams,but will face a team and bitter rival that will outspend the Giants easily,so the Giants will have to make some decisions for the short term and the long term. For now,the Giants,still in need of an excellent bat,will try to patch holes at the major league level,stay competitive for a few years and hope that some player development will come along at the right time. Part of continuing to patch the holes in the off season was keeping their own players as Angel Pagan and Marco Scutaro were re-signed to contracts of 4 and 3 years respectively and Jeremy Affeldt was re-upped for a three year deal to stay in the bullpen. We can argue on the lengths of those deals,but the Giants are attempting to keep a certain core together and hope to buy time for some players to filter through the system and therefore cheap replacements. 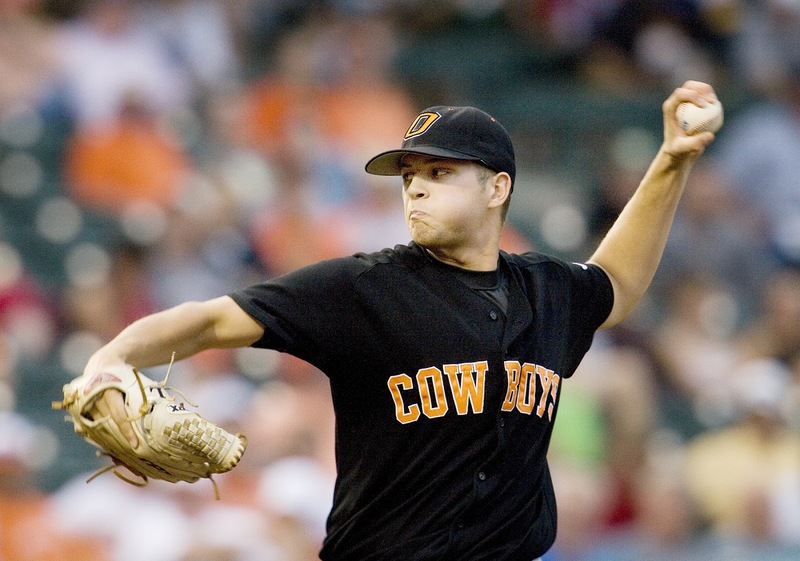 The Giants could have added the big bat in Nick Swisher,but the Giants have reached their budget threshold and hope to get through 2013,when they finally get the bloated contract of Barry Zito off the books. The Giants only outside moves thus far have been a cheap signing of reliever Chad Gaudin from the Marlins and bringing back fan favorite Andres Torres from the Mets after using him to obtain Angel Pagan before the 2012 season. Neither of these are huge impact signings,but they fill small gaps and could be quite useful or make little impact at all. 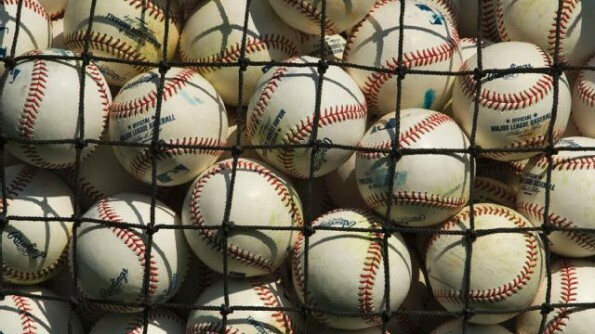 The other reason why the Giants have not made a larger move against the Dodgers relentless throwing of dollars around? They need savings to bank for the Buster Posey extension. An extension to Posey that will allow the team to avoid arbitration that could cost the team more money and as it seems always does-ill feelings from the arbitration process between the team and the player. The need for that extension has more than anything to do with the uninspiring off season for San Francisco. Without Posey,the team has no "face of the franchise" in position players,let alone the National League MVP,the Giants cannot afford problems with Posey and the budget dictates being prepared for that day. Meanwhile,the Dodgers continue to add to their arsenal with the signing of the top free agent pitcher available in Zach Greinke and emerged as the top bidder for Korean star Hyun-Jin Ryu. This in addition to adding Adrian Gonzalez and paying Josh Beckett and Carl Crawford for their past in order to obtain Gonzalez makes the Dodgers not quite finished now or in the future. Los Angeles will have a huge infusion of cash after their cable deal is finished and the Dodgers ownership group does not seem inclined to stop spending. The Giants will have to deal with that and have to make the decision that all teams that cannot compete at the top financially-patch and float or hit the bottom and bounce. If I was making the decision,I would try to compete at the level for the next year or two while Tim Lincecum is still a Giant and then try to rebuild a bit on the fly. After all,Matt Cain and Madison Bumgarner are signed for the long term,perhaps Lincecum could be replaced and that money used to refurbish a position. The Giants have resources and will have more than some,less than others to battle the Dodgers checkbook,but they will have to manage them wisely. Some players that Brian Sabean would like to keep or add will not be able to kept or added and there will be opportunities to improve that will have to be passed on. Tommy Tuberville never seemed to be a fit at Texas Tech. Tuberville was unable to embrace the Tech culture or the Big 12 and looked to be ready for the first job that was offered from the SEC. After being overlooked by his former team in Auburn and by Tennessee,Tuberville was so desperate to leave Lubbock that he left for Cincinnati. That's correct-the same Cincinatti of the lowly (and imploding) Big East. That might deserve its own term for being really desperate to leave something/someplace-Tubervilled. In any case,the Red Raiders were looking for a new head coach and the unexpected decision for Tuberville to take the Cincinnati job after the best candidates around the country had already taken new jobs appeared to hamper Tech's chances of attracting an interesting hire. Well,it was an interesting hire that they came up with anyway as Tech had limits in both time and interested candidates,but one made sense as a high risk.high reward hire. Former Tech star quarterback Kliff Kingsbury was named as the newest head coach after just two candidates interviewed for the job. There are some negatives to the hiring of Kingsbury,mainly just one-Kliff Kingsbury has never been a head coach at ANY level. Yep,he will attempt to jump at just 33 years of age to break his maiden at a Division I job in arguably the second toughest conference in the country. Other than that negative,Kingsbury does not comes with huge risk,considering that there were not a large number of experienced candidates for the job. With his history of starring at Tech being the first of the record breaking passers of the Mike Leach era,Kingsbury will have a honeymoon period in Lubbock that will be longer than the average coach. Honestly,I was mildly surprised that Kingsbury was interested after how the Tech administration bungled the entire Leach situation and the close connection between the two. The positives of the hire? Yes,Kingsbury is 33,but that will help him in dealing with players and he will be able to recruit well with that advantage. Kingsbury will also have a long honeymoon period from Tech fans considering his background and the circumstances that he was hired under. Kingsbury comes to Tech from the offensive coordinators job at Texas A&M and has been given much of the credit for the rise of Heisman winner Johnny Manziel. Kingsbury worked at Houston before that and was key in the development of their former Heisman candidate Case Keenum. Noticing a trend here yet? It will be interesting to see how Kevin Sumlin at A&M does in the next few years without Kingsbury running the offense as Sumlin's success at both schools rose with the arrival of Kingsbury and it will be worth following to see how Kingsbury succeeds without the guiding hand of Sumlin. Between the accomplishments on the field,the background with quarterbacks and the willingness to run the "Air Raid" offense,Kingsbury is likely to have no problem recruiting willing passers to come to Texas Tech and throw forty plus passes a game. One further point on the hire that I think merits considering-most coaches look at Texas Tech as a temporary stop on the way up the food chain. Despite the positives of Tech through the years,their coaches have either been younger coaches looking to make a name that moves on or an experienced older coach that makes Tech his last stop,but for a limited period of time. Kliff Kingsbury might be the exception to the rule,if he succeeds. Similar to Mike Gundy at Oklahoma State,a program with similar problems with coaches as Texas Tech,Kingsbury might choose to make this his career job. 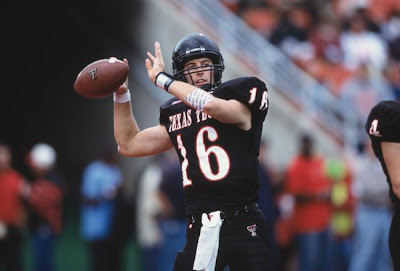 If Kingsbury decides to take that route,he could wind up being a Tech icon twenty years from now. That is something that no other candidate could even consider,let alone offer. Make no mistake,this is a gamble by Texas Tech,but considering the mess of the Mike Leach affair and then the square peg into a round hole hire of Tommy Tuberville,this was Tech's best chance to avoid mediocrity in a state known for its hard nosed football and football recruiting. The Cleveland Indians participated in a three team trade with Arizona and Cincinnati that landed the Tribe four players including 2001 third overall draft pick Trevor Bauer and outfielder Drew Stubbs from the Reds. The Tribe moved some players as well as their best outfielder Shin-Soo Choo is headed to the Reds along utility infielder Jason Donald,while reliever Tony Sipp and first baseman Lars Anderson were sent to the Diamondbacks as part of the trade. The biggest piece of the deal is Trevor Bauer,who hit AA right after being drafted in 2011 and had a cameo appearance in Arizona last season. Bauer comes with ace level potential,but is far from a guarantee as rumors of attitude issues,an insistence on his own throwing regimen,decreased velocity and some control issues last season all led to the Diamondbacks quietly shopping the smallish righthander that has been compared to Tim Lincecum in the past. Bauer posted very good numbers at AA Mobile and AAA Reno,but did struggle a bit in September in Arizona. 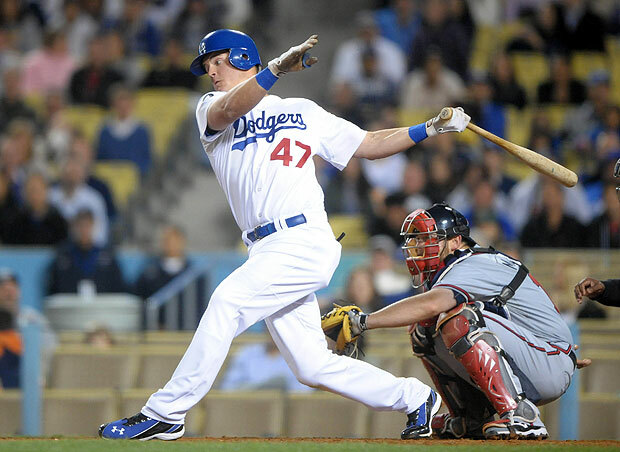 Drew Stubbs is a fast,strong and good defensive outfielder and is just 28. Well,severe contact issues (.213 last season) and tons of strikeouts (588 in 486 games) have made Stubbs a frustrating figure to a Reds fan. Stubbs has decent pop (59 homers in his 3+ yr tenure) and runs very well (110 steals over the same time) and it is not unreasonable to hope for Stubbs to be a 20 homer,30-40 steals player. It also could be that between Stubbs and recent signee Mark Reynolds that they could combine for 350 strikeouts causing holes in the Cleveland lineup. I'm willing to give Stubbs a full season,but he might be a better fit as a 4th outfielder on a good team..
Cleveland also obtained two righthanded arms for the Indian bullpen in the deal in Bryan Shaw and Matt Albers. The 25 year old Shaw has appeared in 97 in the last two seasons and was solid in keeping his ERA a little over three in the term. Albers is 29,played for Terry Francona in Boston and is coming off his best MLB season with an ERA of just over two in a year split between Boston and Arizona. Both should have spots in the Tribe corps. Shin-Soo Choo will be a loss to a less than threatening lineup,but his highest value was now and the Indians were smart to move him. Jason Donald is a light hitting infielder with little hope on holding a regular position,Lars Anderson is a faded prospect that never caught his stride at higher levels,while Tony Sipp was a decent lefty from the bullpen,but one that can be easily replaced. Shin-Soo Choo was highly unlikely to re-sign with the Indians after the 2013 season and getting Bauer for Choo would have been a reasonable return,but adding Drew Stubbs to replace Choo in the outfield and add two arms for the bullpen makes this deal terrific at best and even if Bauer and Stubbs do not produce,the trade still could be looked back at as understandable at worst. I have no idea what the real reasons were that Arizona went from taking Bauer over Dylan Bundy to trading him for Reds prospect Didi Gregorious and essentially some spare parts,but in my opinion,they did not get fair value. The deal seems like a good gamble for Cleveland (especially considering they kept Asdrubal Cabrera to make another deal) and my question is why Arizona did their portion of this deal. On a rainy day that saw so many former Browns come to Cleveland as members of the Kansas City Chiefs,Cleveland overcame a bad start and pulled away for a 30-7 win at Cleveland Browns Stadium. Trent Richardson rushed for two touchdowns on an otherwise pedestrian day and Phil Dawson booted three field goals to pace the Browns offense,which was supplemented by a 93 yard punt return for a score by Travis Benjamin. 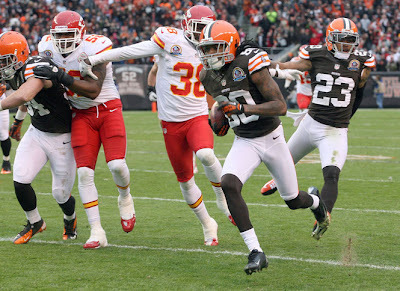 1) The game did not start strong on defense as Jamaal Charles ripped off an 8o yard TD run on the first play of the game and on the next Kansas City possession,Brady Quinn hit Dwayne Bowe for a long gain that put the ball deep inside the Cleveland red zone. The Chiefs would not threaten again until midway through the fourth quarter. 2) Two big plays in the punt return game. Travis Benjamin's touchdown was set up by some changes before the punt as Josh Cribbs moved up towards the line of scrimmage,which forced changes in the Kansas City coverage scheme. Cribbs would later just miss breaking a punt for a score that would set up a Cleveland field goal. The Benjamin return was a new record for longest Browns punt return breaking the former record held by Eric Metcalf. 3) Not totally happy though,Two touchdowns came off the board due to penalties on a drive that Cleveland settled for a field goal. A pass interference call on Trent Richardson was one of those that really was not a ton of contact,but with the ref standing right in front on the play is going to be called every time. 4) Brandon Weeden did have some TD passes taken off the board,which would have made his numbers look better,but he still hesitates before throwing and my major pet peeve is the large amount of passes that get knocked at the line of scrimmage each week. One of the knocks on Colt McCoy was his size and being able to see over linemen. Weeden's numbers could have looked worse as well as Kansas City dropped two passes that could have easily been interceptions. 5) Trent Richardson is playing through pain with a rib injury,but it is clear the ribs are bothering him. That is natural,rib injuries are painful in everyday life,but it has affected his ability outside the tackles with 42 yards on 18 carries. 6) Brady Quinn was,well Brady Quinn,but he had little time to throw the football. The Browns dumped Quinn five times and harassed him all day. 7) Three field goals by Phil Dawson with the first being number 300 on his career. 8) It is not hard to see why the Chiefs have won just two games-too many failed Browns! A failed Browns head coach,a failed Browns offensive coordinator,a failed Browns first round quarterback and a one year wonder Browns running back all are key parts in the Kansas City lineup every week. 9) I am not a Pat Shurmur fan and I believe that this run was expected by me (other than getting the Steelers without Ben Rothlisberger),but these rumors flying around about changes seem out of line. Three games to go against three teams that are in the playoff chase. 10) I'll be doing a post this week looking at these rampant rumors on Mike Lombardi (NFL Network blowhard) coming to Cleveland as their new GM and the possibilities on the head coach if Lombardi gets this job. I do believe those of you that like the angry blogger will like this one. Juan Manuel Marquez thought he had won three close bouts against the better connected (read promoter) Manny Pacquiao,but the record showed an 0-2-1 record vs Pacquiao regardless of anyone's opinion. Marquez had vowed to attempt to go for a knockout as the only way that he was guaranteed to win. You hear that talk a lot in boxing,so you tend to take that with a grain of salt. Leopards don't change their spots and it is tough for fighters to change what they do best. Juan Manuel Marquez did just that as he countered Manny Pacquiao with a short bullet of a right hand seconds before the end of round six that sent Pacquiao face down to the canvas and conclusively ended the fourth bout of their series. Marquez floored Pacquiao in the third round,but Pacquiao scored a knockdown of his own in round five to even things up. Pacquiao seemed to have the sixth round won before the Marquez counter right that ended the evening in Las Vegas. At the end of five rounds,I had Pacquiao narrowly ahead 47-46 in what was the most exciting bout of the set (which says a LOT) featuring terrific toe to toe exchanges . You have to feel good for Juan Manuel Marquez,who after four years and over eight years,finally has the elusive victory that stamped him officially for what he has always been-an all time great. Manny Pacquiao took the loss in a very sportsmanlike manner and I salute him for his class and grace. As happy as Marquez and his fans are,the fans of Floyd Mayweather might be happier. Mayweather supporters now have the belief that their man would have defeated Pacquiao being certified in the eyes of most as Mayweather won a clear decision over Marquez. I am not so sure as the old axiom styles make fights comes to mind. Marquez had to shift his counterpunching style to an aggressive one against the counterpunching Mayweather or there would have been no action at all. Being out of his element,Marquez was forced into a battle he could not win against the talented Mayweather. Pacquaio is a naturally aggressive fighter and would have been more comfortable pressing the pace against Mayweather. The lost superfight might have been the best action fight of Floyd Mayweather's career and might have added luster to the sometimes less than fun to watch "Pretty Boy". Mayweather (in hindsight) might have known this as one would think that the payday involved would have been far more than the risk if Mayweather would have had little trouble with Pacquiao. Fights like last night (and the atmosphere was electric in Las Vegas) is what makes elite level boxing so special and what for all the ballyhoo the UFC cannot match. Boxing has its issues,mainly the best not always fighting the best because of the Top Rank-Golden Boy feud,but at its best-it cannot be beat for atmosphere. 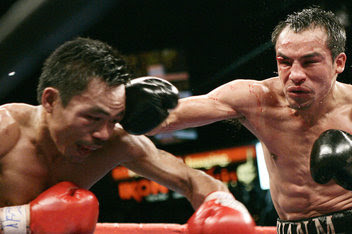 The Overhand Right returns on the eve of Manny Pacquiao-Juan Manuel Marquez IV.. I have a funny feeling that this will go one of two ways (I know I'm fence straddling,but stay with me) and I both are reasonably possible. I can see Pacquiao finally using his speed to overwhelm a suddenly aging Marquez and deliver the decisive victory that he has never gotten,but I can also see this one going like the others-nip and tuck and the judges finally (after all the bad publicity) bend over backwards to give the decision to Marquez. Judges are human too and don't bet against that being in someone's subconscious mind. If it is razor close and goes Marquez's way,I would bet money that somewhere,sometime-these guys hook it up down the road for a fifth time. I've thought Marquez won all three fights,albeit that any could have went the other way. I think the two scenarios above are the most likely,but I lean towards the second and a narrow Marquez win. Does he get the decision is the better question? I must admit to some surprise in Austin Trout's upset win last week over Miguel Cotto. Trout clearly outboxed Cotto and from that performance likely will not rate high on anyone's dance card in the near future. Even though Trout and WBC Jr.Middleweight champ Saul Alvarez are both promoted by Golden Boy,there is almost no way Golden Boy will put the cash cow that is Alvarez in against Trout anytime soon. Alvarez can just as easily get outpointed by Floyd Mayweather for PPV money as he can by Trout on Showtime. Boxing returns to the Networks on back to back weekends in December with CBS showing a Leo Santa Cruz 118 pound title defense with NBC airing the Tomas Adamek-Steve Cunningham rematch the following week. I have always proposed that boxing cannot bounce back without more free TV bouts. Ricky Hatton was leading his comeback bout against Vyachaslav Senchenko before being stopped by a body shot in the ninth round. Hatton announced his retirement after the bout. Hatton was always a limited,although exciting fighter to watch and the loss cost him a bout against WBA Welter champ Paulie Malignaggi,who Hatton defeated a few years ago. Speaking of Malignaggi,who ranks near the top fighters list that I tire of seeing and hearing about "how this time he truly has put it all together" only to lose in convincing fashion and then show up a year later with more of the same pap,he may be a boring fighter,but he might be the best color analyst in the game. Malignaggi is bright,knows the sports history and clearly knows his stuff. As much as I dislike seeing him in the ring,that's how much I like his work behind the mic. I hope to see Malignaggi with a regular post when his career concludes. Wish I could say the same for the Showtime replacement for Gus Johnson,when Johnson is away with football and basketball games, in Mauro Ranallo. Ranallo comes from the MMA world and his excitable style is similar to Johnson as his "I am reading this fighters resume' off this sheet that the research staff gave me in order to look knowledgeable"manner of speech. Showtime has the best analysts in the game with Al Bernstein and Paulie Malignaggi,its too bad that they do not go out and get a qualified blow by blow man to go with them. Nope,not the tale of an adorable little dog on a PBS show,but a love affair with an offense. From my formative years through the late 1980's,Ohio State was seriously challenged for the top spot in my heart. The Buckeyes held serve and Texas Tech was my far away team as I scrambled to find info in the non-internet age,but the Oklahoma Sooners were the top challenger to the Buckeyes. In fact,I hated the two times that the teams played in 1977 and 1983! Why? It was the personality of Barry Switzer,his colorful players and the wonder that is option football or more specifically the Wishbone offense. Texas might have started the Wishbone by being the first team to popularize the offense,but it was Switzer and the Sooners that truly installed the offense as a rarely stopped force. As successful as the Longhorns were running the 'bone,the Sooners version was better for one reason-Barry Switzer committed themselves to recruiting the African-American athlete at all positions instead of just at specific positions. The Sooners were playing black quarterbacks at a time that other teams were hardly recruiting black players and that made a huge difference between the Sooners and other teams using the system. With the elite players playing for Oklahoma and with the strengths of the offense,the Sooners did not lose very many games when I was a Sooner fan. To this day,I can remember Sooner quarterbacks like J.C.Watts,Thomas Lott and Jamelle Holieway running the corner and making that last second pitch to a trailing back,who would then shoot down the sidelines for a long touchdown run. The offense featured three running backs on the field with a fullback stationed directly behind the quarterback and the two remaining halfback split behind the fullback,which looking at it from behind the line of scrimmage gave the offense its name. 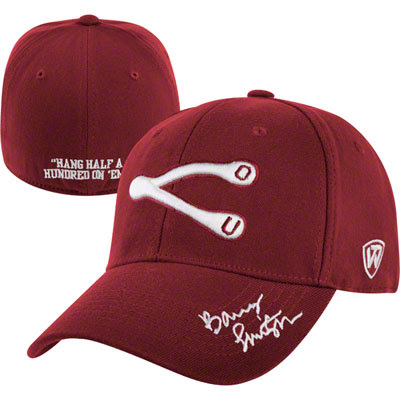 The Wishbone required a quarterback that was able to think on his feet and he had to be quick on them as well. The three options that a quarterback (therefore the name of Triple Option) had to read from the line of scrimmage was for the quarterback to run ( that could also be a pitch further down the line),hand the ball off (usually to a fullback straight ahead,but could be a halfback run as well) or the seldomly called pass play. The Wishbone did not have many passes called other than the occasional short pop pass over the middle to the tight end. It was not uncommon for a Wishbone team to throw less than ten passes a game and often five or six might be the height of the passing numbers. The offense was not for everyone as the 1985 National Champion Sooners found out as they struggled with Troy Aikman at the controls. Aikman could not run the traditional bone,so Oklahoma tried a hybrid in order to take advantage of Aikman's strengths. The results saw the Sooners lose their only game of the season with an offense that was sputtering and only when Aikman's season ended with a broken leg and freshman Jamelle Holieway running the pure Wishbone did the Sooners go on their title run. The two major issues with the Wishbone as defenses began to figure it out were that you needed at least two quarterbacks as the QB's took so many hits and that if you got behind,the limitations in the passing game (with three running backs,there is only one wide receiver) make it very difficult to catch up on the scoreboard and when trailing,if you choose to stick with the running game,the clock rolls on so much faster without the incomplete passes to stop the clock. The Wishbone is still used by a few teams,Georgia Tech uses a variation of the offense,the military schools use it as an equalizer against the bigger schools and I-AA powerhouse Georgia Southern has used it ever since their program was started in the 1980's,but it is not in vogue currently as most quarterbacks want to throw the football more than the offense would allow. I love option football and I love watching it. Few games in my tape collection (now DVD) get more use than old Oklahoma games just because I enjoy them so much. I wish someone would give it a try with a top program again,but I kinda doubt that will happen. In any event,that's the story on the Wishbone and my years singing Boomer Sooner. The Rule 5 draft this morning saw some familiar names switch teams (for now),the Pirates pass on adding anyone and the Indians add another intriguing player to their collection of first basemen. Ordinarily,the Pirates and Indians would be at the top of any Rule 5 talk,but not this year as one of our favorites was the third player selected as Danny Rosenbaum was tabbed by the Colorado Rockies. The lefty was selected to the Eastern League All-Star game after a blazing start to the season,but faltered a bit in the second half for AA Harrisburg,resulting in an 8-10 record with a 3.94 ERA. The former Xavier Musketeer had never posted an ERA over three before 2012 in any of his previous minor league stops. Rosenbaum has back of the rotation potential,but may be a long reliever in Colorado in order to stick through his Rule 5 status for the 2013 season. I have been working on interview questions for Danny,among others,so I'll have to revise those a bit after the Rockies changing his location! Two other former Hagerstown Suns were selected as infielder Jeff Kobernus was selected by Boston and then traded to the Detroit Tigers and oft-injured pitcher Jack McGeary was a Red Sox selection in the AAA phase of the draft. The contact hitting Kobernus looks like he will have a chance to stick as a utilityman,which makes sense since he can play all around the infield and the Tigers noted that they even wanted to give him some work in the outfield in Florida. Jack McGeary was drafted with lots of hype as the then awful Nationals were creative in signing a first round talent after picking him in the sixth. McGeary was (at first) allowed to finish his school year at Stanford before reporting to the team (McGeary was drafted out of high school making this very unusual). Arm injuries and control problems have hampered McGeary for most of the last three seasons,which has seen McGeary unable to return to even Hagerstown,let alone move through the system. The Cleveland Indians lost two pitchers,but might have picked up a bat to add to a system in desperate need of them. Chris McGuiness was traded from Boston to Texas in 2010 as part of the trade that sent Jarrod Saltalamacchia to the Red Sox.and after an injury filled 2011 looked to be a disappointment for the Rangers. However,a huge 2012 at AA Frisco put the lefty slugger back on the prospect radar after a 23 homer season and a followup with an MVP performance in the Arizona Fall League made McGuiness a likely pick of someone in the draft. McGuiness makes lots of sense for an Indians team badly in need of some power in their lineup and system. I would almost wager that Terry Francona might have had a little influence in this pick as he had to have known McGuiness from his time in the Boston organization. The Indians lost two pitchers in the Rule 5 draft as Hector Rondon was the second pick overall to the Cubs and T.J. Mcfarland went late in the first to the Orioles. The once promising Rondon had electric stuff before ailments limited him to just six games over the last two seasons. The Cubs are gambling just 50k that Rondon's issues are behind him,if they are,they picked themselves quite an arm. McFarland won 16 games between AA Akron and AAA Columbus,but his history has shown that he often repeats each level for a second season. The lefty is just 23 though and the Indians are not exactly filled with starters in their system,so if the Orioles offer him back,I would bet Cleveland takes him. No Pirates or Giants Rule 5 picks,although the Pirates did send pitcher Kyle Kaminska to Boston as the PTBNL in last week's acquisition of Zach Stewart. Kaminska was only a Pirate for a few months as he was obtained in the Gaby Sanchez trade with the Marlins.. I figured the winter meeting would feature next to no news from the Pittsburgh Pirates,but a minor move that might pay dividends in a major way for the defenders of PNC Park. Pittsburgh traded Ramon Cabrera,who spent last season at AA Altoona to the Detroit Tigers for former Oklahoma State lefthander Andrew Oliver. Oliver has spent some time in the big leagues with short stints in 2010 and 2011 after being moved very quickly through the Tigers system. Oliver throws hard and was converted to a reliever last season. I have always liked Oliver and if you had asked me last winter that the Pirates could get Andrew Oliver for Ramon Cabrera,I would have told you to get real. The only reason that the Pirates have a chance to get a talent like this for the cost that they paid comes down to one thing-Oliver has had control issues. 88 walks at AAA Toledo shows this pretty clearly. If Oliver gets his control issues straighten out-this is a steal for Pittsburgh. Ramon Cabrera hit .276 for the Altoona Curve,but only hit five home runs and I didn't see him as a starting level big league prospect. Singles hitting catchers are not usually huge losses and I don't think we will be looking back at this deal with regret even if Andrew Oliver never pitches an inning in Pittsburgh..
Football is a weekend game,baseball's winter meetings have featured the Giants re-signing Angel Pagan and Marco Scutaro,the Pirates sitting on the hands while the Indians are shopping Asdrubal Cabrera while looking for a return of Ted Williams,Bob Gibson and two prospects. The Cavaliers are battered by injuries and as a result beaten on most nights and the Devils are watching guys meet in a board room. So that leaves not a ton to write about,but let me see what I can type. I was once told that "Christmas is a special time",like I could not have figured that one out on my own,but that is not always the case. It is not always a special time for all of us. Don't get me wrong,I don't have too many problems when things are located at the World Headquarters,but it isn't always so wonderful when I am elsewhere. It is not that I don't like or care about those family members/friends,it is just that I am most comfortable in the little bubble here. The stress of the holidays affect some more than others (I generally don't mind them,I can have the same issues over gatherings for a weekend barbeque) and many get the holiday blues. I have a family member that is almost like clockwork when they get hit with the holiday tremors and it truly affects them. I think a lot of this is because in our time,the movie/tv industry really makes some people (and occasionally even this writer) just feel like their family life falls far short. It makes sense because they are just entertainment and few of us can match the fantasy world where all is great,everyone gets along and big families travel from around the country to spend the holidays in mom and dad's huge house. Really,how many of us can afford to take that time off work? The holidays really can be "a special time",but perhaps all of us (me included) should try a little harder to make them a little easier for those that struggle with issues. The lovely Cherie and I are taking a page out of my parents book and locating a feeder and eventually another one as near to a window as we can to watch them more. 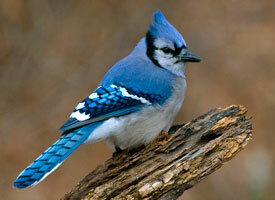 Thus far,we are getting a few,but my main goal is to attract more Cardinals,Blue Jays etc. This picture is not mine-BTW,if any of you have experience in attracting the more visually striking birds-feel free to comment,I'll take any advice given! The Cleveland Browns overcame an extremely muddy field to slog their way to their second win in a row in Oakland as the Browns defeated the Raiders 20-17. Brandon Weeden threw for 364 yards and tossed a 44 yard touchdown to Josh Gordon to lead the Browns,who drove 94 yards in the fourth quarter to score a Trent Richardson rushing touchdown to put the game away although Oakland scored a garbage time TD with a one second to go to cut into the final margin. 1) I am not sure how to feel on this. This could be one of those meaningless wins that costs draft position that the Browns pull off every year. However,I do see signs of progress from the team and I feel pretty good about that. 2) I am not in favor of a Pat Shurmur return,no matter the final record. Some of the losses were not his fault,but I think if another coach coached these games,the Browns might be 6-6 and that might put them in the playoff race. But I thought Shurmur called maybe his best game of the season in the win. 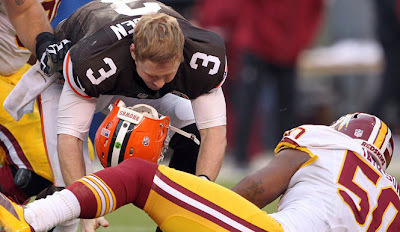 3) Brandon Weeden had good points and bad points in the game. His yardage was impressive and you had to like the 94 yard drive that Weeden led for the game clinching score. 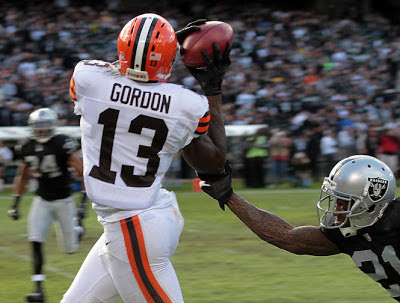 But his interception in the end zone was a really bad one and he badly underthrew Josh Gordon when Gordon had the Raider corner beaten that would resulted in another long touchdown pass. 4) Speaking of Josh Gordon,I am starting to believe that Josh Gordon just might be the number one receiver that the Browns have been looking for. The physical tools are there and Gordon certainly is a big play maker. 5) Phil Dawson missed a field goal after hitting 29 in a row. Tough to blame Dawson considering a bad snap and the muddy conditions. 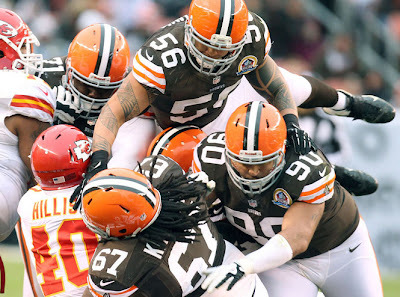 6) The Browns secondary played reasonably well in the win. Other than a long touchdown pass to Rod Streeter,the Raider passing consisted of a bunch (14) of checkdowns to tight end Brandon Myers. 7) Montario Hardesty ran for 39 yards on seven carries and for the second week in a row,showed signs of being a nice change of pace back for Trent Richardson when he needs a breather. 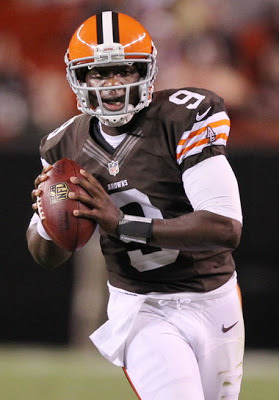 8) Greg Little has gotten a rap of being a player that drops the football,but of late he has not done that. 9) The Raiders have the reputation of being a well supported team,but there were tons of empty seats and the West Coast Browns Backers were loud and very visible in the stands. 10) The offensive line is really jelling (one sack),but a surprising part of that is veteran guard John Greco. 11) After breaking a long losing streak on the road in a game that I thought might be a let down game after the win over Pittsburgh,I am moderately optimistic on the team. I see improvement and a win over the Chiefs would give the team more wins than 2011. I still think it would be a bad idea to let some of these things allow Pat Shurmur to stay (Remember the late season winning streak in 2009 that kept Eric Mangini around and essentially wasted a year),but there is improvement. Here is my occasional (haven't always remembered to write) voting for the Baseball Hall of Fame. Lots of new candidates on the list,so lets go from there. My stance on the PED users is this-IF I believe you were HOF worthy before the PED usage,you get the vote,if not you don't. Basically I am ignoring the numbers for these guys. Barry Bonds-Before PED usage,still the best overall player in the game. Mike Piazza-A defensive liability,but arguably the best hitting catcher ever. Sammy Sosa-To me,an above average player with big numbers inflated by the era and PED's..
Kenny Lofton-Don't laugh,Check Lofton's numbers and compare them to Tim Raines. Julio Franco-If we were drafting to play a game,I'd take Julio Franco over Craig Biggio,but the stats are not quite there. Jeff Bagwell-Great power numbers with some time spent in the worst power park in the game,no proof of PED usage other than big muscles. Dale Murphy-For a few years the best player in the game,if that standard worked to get Jim Rice in,why not Murph? Lee Smith-If dominant closers are starting get elected,big Lee needs to be part of the HOF as well..
Jack Morris-To me,linked to Curt Schilling for the same reasons,only with more wins. Alan Trammell-I am ambivalent on Trammell,I might be persuaded eventually. Tim Raines-A very good player,but I just don't see Raines as Cooperstown level. Edgar Martinez-Not crazy about a career DH,I could live with a few years at career's end,but not for a full career book of work. Don Mattingly-If he was not a Yankee,he would have been just another good player. Fred McGriff-Good for a long period of time,but never great. Mark McGwire-Without PED's just another good power hitter. Larry Walker- A good player helped by Coors Field,the Anti-Bagwell. There's my thoughts,feel free to share yours!!! As I suffered through a few minutes of Gus Johnson commentary during the Big Ten title game,I heard one small nugget of rumor that made me scream-the biggest rumor is Georgia Tech leaving the ACC for the Big Ten? The team that cannot even deliver the market that they play in? Now,Georgia,I could see,but Georgia Tech? Is the Big Ten that desperate to get to 16 teams? First Maryland (arguable) and Rutgers (awful),but at least you can argue that the pair of them bring being the top team in their market to the conference,albeit the NYC market not caring anyway,but Georgia Tech does not even bring that. Of course,I would not like any of the possibilities for the next two teams either. There is no one in the leagues traditional "footprint" that makes sense. Texas and Oklahoma would be additions that would be worthwhile,although disappointing,but the Big 12 has them seemingly locked up. Florida State would make sense,but I am not sure they are an academic fit. None of the SEC teams are going to leave that cash cow,so who does that leave that fits the academic needs,being a state school as well as expanding the league into new markets? Do any of these thrill you? Because I bet that two of these three are going to be the other two members of the Big Ten. Think about that and the drop in Big Ten football quality. The Big 12 has their contract signed to force teams that leave their conference for another one to pay them a percentage of their income from their new league back to the Big 12. That will be a far higher cost to leave than the ACC's 50 million tag. Texas,Oklahoma and maybe the prestige of Kansas basketball would all make sense,but unlikely. Clemson and Florida State are not strong candidates from the academic side. Miami would make sense to get into Florida.but their scandals might make that a tough sell. Connecticut would not bring much to the table,although they would leap at the chance as would Cincinnati,but that market is covered with Ohio State. Syracuse and Pittsburgh just wrote a check to leave the Big East,they aren't writing another one to leave the ACC this soon. Boston College would bring a new market,but being a Catholic school,they aren't a fit unless Notre Dame comes with them,which isn't happening due to the Irish reluctance to join a real football conference. If there are any other real candidates,I cannot think of any at this hour,so if I missed one-comment! In any case,this is a looming disaster for a league that wants to improve as a football conference and nabbing the dregs of the ACC sure is not going to help matters. I never favored Penn State or Nebraska,but you could argue that they brought tradition and strong programs to the table,which more than you can say for the two new additions and any of the likely two future schools. In hindsight,Missouri might have made sense to grab with the St.Louis and Kansas City markets when they were interested instead of wasting time saying they were satisfied with 12 teams. 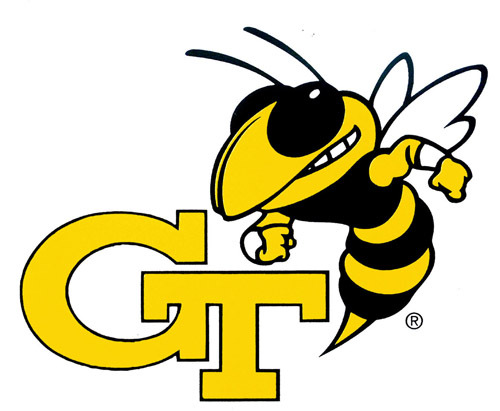 North Carolina would add the Charlotte market and the prestige of UNC hoops,but little otherwise,which is more than Virginia or Georgia Tech would. Please enlighten on how Maryland.Rutgers,North Carolina and Georgia Tech helps the Big Ten? Because I don't see it at all. Sure,I think my issues with Thursday Night Football start with some minor things (Like I never get to see the second half),but that is beyond the most important point that seems to be either something that the NFL did not take into account in planning or just plain did not care about when doing so.. I have some smaller points that I dislike the NFL Network's TNF broadcasts such as disliking Mike Mayock (I wince just thinking of the 1990's ESPN2 CFL pairing of Gus Johnson and Mayock),the awful pre-game crew (When Steve Mariucci is the best of the bunch-you have major problems),the less than strong visuals and the usually non-compelling pairings (Unless you have a team involved,it usually is not worth the time). I am not always against Thursday football. I have no problems with the Thursday game to start the season, I have no problems with the Thanksgiving tripleheader and if pressed,I might even go with a last 4-6 week run at the end of the season when the college season is over. However,games every Thursday is lunacy. Not just because the product can be more than subpar (thanks to the decision that every team must appear once on "national tv",the teams are often losing squads),other than the week two Packers-Bears game and this past Thursday's Saints-Falcons matchup,the games have generally been less than stellar. Or that the league may be on the verge of reaching overkill with too much football. It is because of the NFL's lip service on the issue of concussions and then force two teams to play two games in five days. Boiling it down to its essence,the league (and Roger Goodell) seems to place money above the health of its players. With the deluge of former players with legitimate health concerns from their career beginning the legal process for damages from the league,one would think that a league would be taking care of its current players by not wanting to lengthen the season or adding games on short rest. The additional risk of injury should outweigh any financial gain,which mainly comes from having live games on the NFL Network and the fact that the games are between good teams or bad ones should be besides the point. The fact that most would be the lower level games on CBS or FOX on Sundays makes them even more of a bad idea. I don't see these as money makers and if that is the goal,I am not sure that goal is realized. 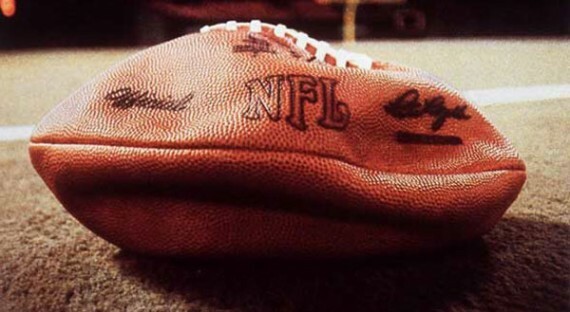 All things considered,perhaps the NFL might be nearing the point of overexposure.